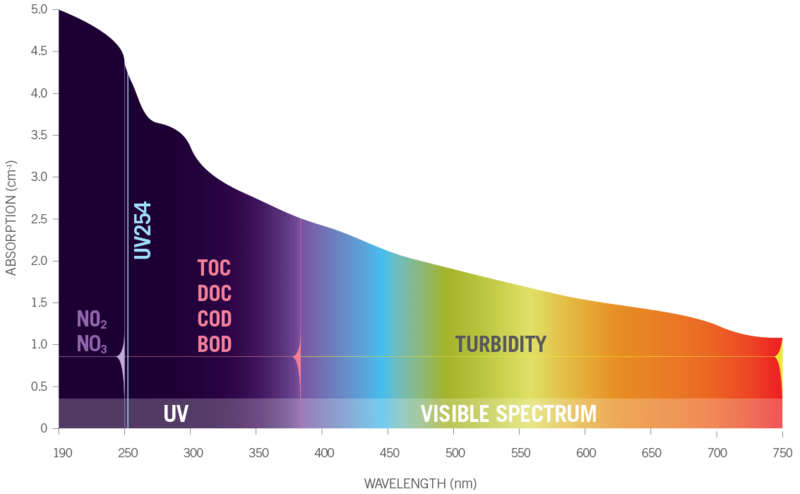 Spectral absorption is a measurement of the amount of ultraviolet and/or visible (UV-VIS) light absorbed by a water sample of a given path length. Absorbance is directly proportional to the concentration of matter in the sample. Ultraviolet and/or visible light is passed through a quartz cell containing the sample water. The intensity of attenuated light is measured with a sensor at a single wavelength or at multiple wavelengths. WHAT CAN BE MEASURED WITH SPECTRAL ABSORPTION TECHNOLOGY? There are several different types of matter, such as organics and nitrates that naturally absorb light in distinct regions of the UV-VIS wavelength spectrum. Using absorbance data in combination with laboratory data for a target parameter or contaminant, it is possible to build a relationship or “calibration” from the two data sets. HOW ACCURATE IS THE CORRELATION? The accuracy of the measurement is highly dependent on the strength of the calibration. Real Tech takes a custom approach to calibrations by using data collected from the local site to ensure high quality results for our clients. Custom or local calibrations are far more reliable and robust in comparison to global calibrations, as they incorporate all relevant information that influences the matrix of the sample. The local calibration is audited periodically to validate the relevance of the calibration to ensure accuracy. The audited data can continually be added to the calibration set, furthering the robustness of the calibration.